That’s a very good question. I can find inspiration in most anything I see that interests me. I also use life events to write my books. I have a muse who will do cartwheels when she knows we have found a good idea. Her name is Blooderfly. She prefers horror and mystery stories, as do I. My inspiration for Gypsy Spirits came from a real life event. The first scene in the book was an argument between Annamarie and Daniel, two of the man characters. That argument and the utterance of the Gypsy curse actually took place one July morning between my ex-husband and me. There are a few Gypsy facts in the book my mom told me. She heard the stories from her grandmother. Other than that, it’s all imagination. I also find inspiration in pictures. A friend posted a picture of iron gates held up by a huge brick arch sitting alone in the midst of the woods. I wrote the short story, The Forgotten Gates, from an idea that popped into my mind while looking at the image. Another image of a frightening clown brought back a memory of being lost inside the fun house with my dad when I was six. I wrote the short story, The Fun House. It is the first in a series of “Evil Doll” short stories. Gyspy Spirits and the sequel, Annamarie and Magdalena, are available on Amazon now as e-books. I am working on the third book in the trilogy, Lena, now. 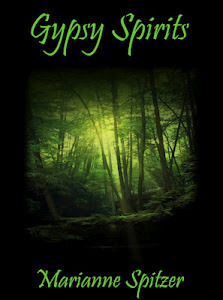 I have also self-published a supernatural mystery, THE LETTER, which I wrote for 2011 NaNoWriMo. I had a small idea of an evil grandfather and it bloomed from there. The sequel, Old Man Malone Returns, will be available early this summer. My family wonders how I can see things in images they don’t see, or how I come up with my ideas out of the blue. I am not exactly sure. It is something that has been with me for a very long time. The first scary story I came up with was when I was eleven. I told my brother a spooky tale as a bedtime story one night. Unfortunately, he was only three at the time. He didn’t appreciate it and screamed at the top of his lungs. My mom didn’t appreciate it either and I was forbidden to tell my brother any more stories. However, I did get the idea for the short story, The Witch’s Cross. I thought it was worth it although my brother says the thought of the story still scares him. Isn’t that the idea of writing a horror story? Happy reading!! Spirits? Madness? Which haunts Daniel? His teenage bride, Annamarie, must answer the question while she deals with her husband’s controlling behavior and abnormal fear of spirits he believes exist in the surrounding woods near their home. During an argument, her anger erupts and she yells a few odd words at her husband, Daniel, which she explains is her Gypsy curse. A bad day at work convinces him the curse is real, but after the brutal death of his best friend, his belief in the curse and his terror of the spirits escalates. Annamarie begins to have foreshadowing dreams of a young Gypsy girl who resembles her in every way. As the dreams become more vivid and frequent, Annamarie begins to fear her utterance of a Gypsy curse may have brought spirits into their lives. When they both have the same dream, she believes Daniel’s fears may be real. They feel they may be close to answers when a human killer enters their lives. With two battles to wage they must stand strong together. Frightening events spiral out of control and Annamarie must fight for her husband’s safety, his sanity, and her own. Thank you for having me on your blog, Christie. I enjoyed it very much.